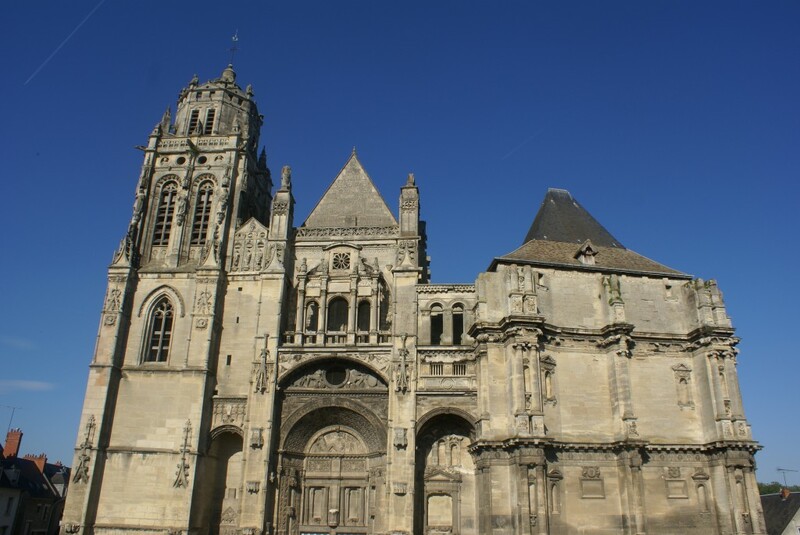 The Saint-Gervais Saint-Protais church is one of the finest religious monuments in Normandy. 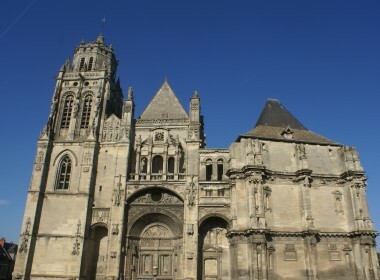 It was built from the 13th century, rebuilt and embellished until the 16th century. It was the dimensions of a cathedral (70 meters long, 27 meters high under arches) in which play Romanesque, Gotic and Renaissance. Often comparing, thanks to its size, at the Senlis Cathedral (Oise). It has five ships and six bays with wide nave surrounded of aisles and beaming chapels. The merchant guilds and religious brotherhoods in the 15th and 16th centuries have contributed, through their donations, its beautification. Outside, the west front – Gothic and Renaissance – filigree architecture mixes, central portal with triumphal arch and tower monumental order. The north side of the transept still present its intricately carved wooden doors, which are the first examples of use of renaissance motifs in the church. Inside, the nave has an elevation without discontinuity, without capital, main feature of Norman Gothic art. This choice of simplicity in the height is a symbole of elevation towards god a search for greater brightness. The transept has, in its southern part, a gallery decorative with beautiful plant friezes. The nortern arm is covered with ribbed vaults, curve and niches carved dais. The choir consecrated in 1249 is finished with a flat chevet decorated with a rose window. It is Gothic Flamboyant lined with double aisles; it presents an elevation at three levels. This elevation is francilienne inspiration and reminds the elevation of Notre-Dame Cathedral of Paris. The tower of the Rosary (south side) presents a superb carved Jessé tree. This is the family tree of Christ’s ancestors. A spiral staircase provides access to the organs. It is Renaissance style and reminds the stairs of the Castle of Blois (Loir et Cher). On the south side of the nave, there is three beautiful carved pillars : the pillar of the dolphins marked with fleur-de-lis and the dolphin, symbol of the King of France Saint Louis, the pillar Saint Jacques with shells connected by a cord and the Saint-Claude pillarrepresenting the work of the tanners and the Saint’s life. One the same side, in the chapel Saint-Cler, a transit, decomposed corpse, carved in high relief in the wall dated to the 16th century, delivers a message that invites reflection : “whoever you are, you will be struck down by death; stay here, take care, crie. I am what you will, a ash heap. Implore, pray for me”. A “Grisaille” stained glass dedicated to the life of the virgin is visible in the south chapel of the choir. This is a high quality paint, Renaissance work that reminds the stained-glass windows of the gallery psyche of the Ecouen Castle (Val’dOise).The “grisaille”(gray tones), the silver yellow stain, the blood-red and the blue enamel are placed on a white glass. The figured decoration, the costumes to the antique, the tormented landscape and a decor of ruins are inspired directly by the style of the school of Fontainebleau. The chapel of Notre-Dame of the Assumption, dedicated to the virgin, in in the northern extension of the choir. Its construction was funded by a Royal brotherhood founded in 1360 by Charles V. A large bas-relief present in bright colors (blue background and golden lilies) the King, the Quenn, followed by the three orders in procession : nobility, clergy and people. In the 3rd north chapel of the nave, a beautiful stained-glass window dedicated to Saint Crepin and Saint Crepinien is still visible. Four scenes on three registers evoke the martyrdom of the patron saints of shoemakers. A scenes represents them, in a very realistic way, plunged into a cauldron of boiling water, whose the contents pours over their executioners. The church is freely accessible and free of charge from 9 am to 18 pm everyday all year round. Conditions of guided tours : guided tours only on reservation in advance at the heritage service on 00 33 2 32 55 59 36. Duration of visit : 1 hour – price 5 € full price / 3 € reduced price.